Apart from the rank, and soul stamp, Constellation system is also one of ways to increase players’ power. After completing the quest “Book of Gaea”, players can unlock the Constellation system which can boost players’ attributes. For example, Aries can increase players’ HP. Leo can boost players’ Physical Attack and Pisces can raise players’ Magical Attack. The higher the Constellation level, the more attributes it can offer. To level up the Constellation, players have to spend Stardusts and reach the required level, because some star signs require a certain level to unlock. 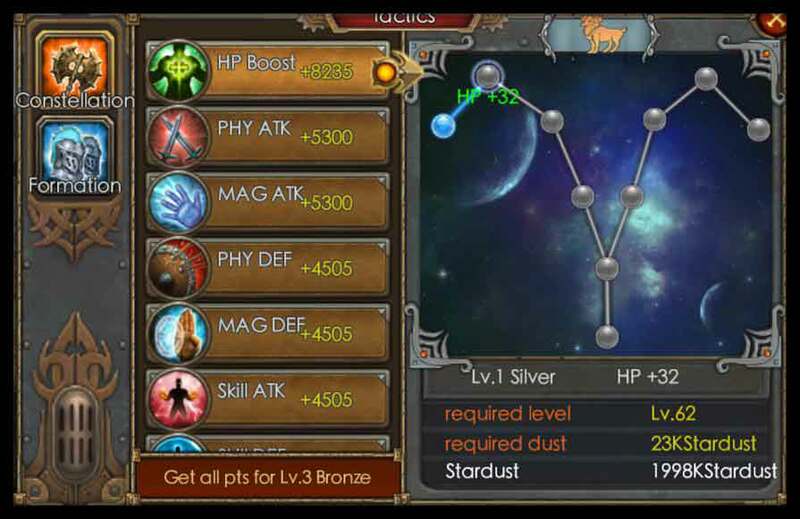 As regard to the Stardust, players can kill monsters, complete daily quests or treasury system to gain it. Plus, the stardust cost increases with players’ star sign level. At the early stage, players just need a few Stardusts, but at the later stage, you will need massive one. Be prepared for it! To sum up, there are a number of ways to make you strong besides the Constellation. To achieve the best effect, you must try all the ways.